The South Korean government pledged Monday to invest more than 30 trillion won ($26 billion) to establish a full-fledged 5G environment by 2022, as the country beat its competitor by a hair to begin commercial services of the hyperspeed network last week. 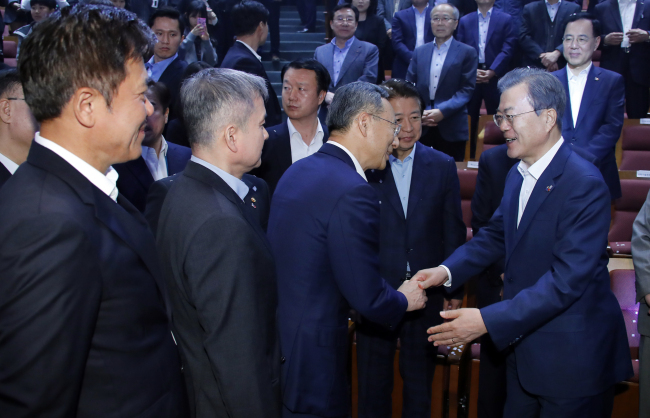 During an event to mark the achievement at the Olympic Park in Seoul, President Moon Jae-in introduced the country’s comprehensive 5G-based initiative. In collaboration with private companies, he pledged to build a nationwide 5G network by 2022, with a plan to promote 5G-based industries extensively. Describing 5G technology as a new growth engine, the president vowed to create $73 billion worth of exports and 600,000 jobs by 2026. To achieve the goal, the government pledged to promote industries such as autonomous driving and digital medical care. “5G is like a telecom highway without traffic,” said Moon, describing 5G as a hyperspeed, low-latency network with the capability of delivering information 20 times faster than the previous 4G Long Term Evolution with latency up to one-tenth of the 4G system. Korea’s capability to deliver 5G networks is reportedly restricted to populous Seoul and other metropolitan cities, though the government claims the country rolled out the world’s first 5G commercial services. SK Telecom, KT and LG Uplus had beaten Verizon “by two hours” in offering 5G commercial services on April 4, moving up the original schedule a day earlier. Verizon later dismissed the move as a public relations stunt, as the Korean companies modified the subscription term for a few selected celebrities. Despite the ongoing dispute over the “world’s first” title, Moon stressed the importance of seizing the initiative in using the network. According to the president, the global 5G industry will become a 1,161 trillion won market by 2026, about twice as large as that of semiconductors. To encourage prompt construction of nationwide 5G networks, the government vowed to lower taxes for network construction by up to 3 percent. According to government estimates, mobile carriers have spent at least $2.6 billion this year alone on 5G technology. Describing 5G as infrastructure crucial to the country’s “innovative growth” economic initiative, the government said 5G technology would accelerate a digital revolution unfathomable in the past. Given concerns over the lack of 5G content, the president chose five key service sectors based on the hyperspeed network: wireless standards, including immersive content, smart factories, autonomous driving, smart cities and digital health care. Regarding autonomous driving, the government said it will operate self-driving shuttles by 2020 in major cities, such as Daegu and Pangyo. Five years later, about 1000 5G-powered buses will be available in provincial municipalities. As for the digital health care system, 5G-based emergency medical treatment services will be developed by 2021, according to the government. Some 20 percent of emergency medical centers will be able to use the system by 2025.